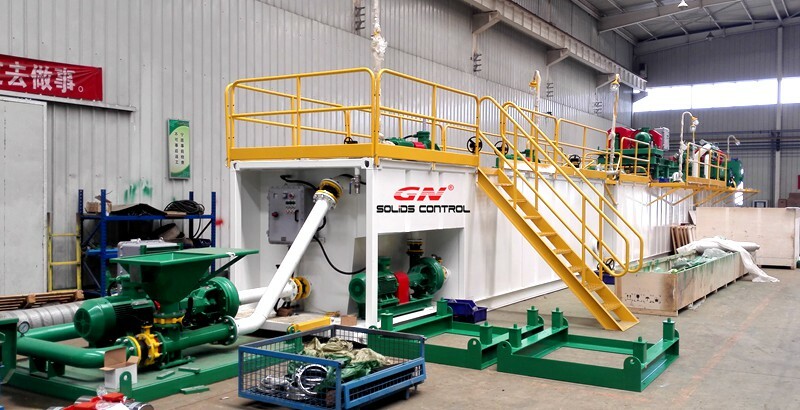 Last week GN solids control shipped a 3 mud tank recycling system for CBM project in Shanxi, China. 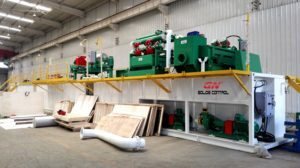 This is a 500gpm mud recycling system with 1 unit of shale shaker, 1 unit of mud cleaner and 1 unit of middle speed decanter centrifuge. CBM mud recycling system is different with HDD mud recycling system and oil drilling solids control system, the design should be compact design and with smaller storage capacity. This system is customized design after communication with the client. But the separation cut point should be smaller compared with HDD mud recycling system, normally desilter cone separation point is 15 ~ 20 microns, which is enough and acceptable for Horizontal directional drilling. But after long period drilling, the ultra fine solids will accumulated in the drilling fluids, which is not suitable for preparing the new drilling mud and re-used for drilling, that is why a decanter centrifuge is adopted in the mud system, the separation cut point is 5 ~ 7 microns. (2) GNZJ703E-1S8N mud cleaner with 500gpm treating capacity, 3 panel bottom shaker and 1 pc of desander cone and 8 pcs of desilter cone, the separation point of desander cone is 40 microns and separation point of desilter cone is 20 microns. (4) 3 mud tanks with multi function- recycling, mixing, storage. One of the mud mixing tank with mixing hopper and mixing pump. Not only for CBM mud recycling system, GN solids control also provide mud cleaning system for HDD, water well drilling, geothermal drilling, construction projects, pilings, TBM, etc. Pls contact with GN solids control for more details.